This show focuses on the apical decades of Mario Deluigi’s work—the 1950s and 1960s—specifically documenting what is perhaps the artist’s best-known series: “Grattage” (Scrapings), 1953–78. First exhibited at the Twenty-Eighth Venice Biennale under the title “Motivi sui vuoti” (Motifs on Voids), the pictorial works feature painted surfaces that Deluigi carved with razor blades, shears, scalpels, and the handles of paintbrushes and spatulas, as if allowing a clear, sidereal light to emerge from preparatory depths, thereby drawing attention to the immaterial dimension of painting. 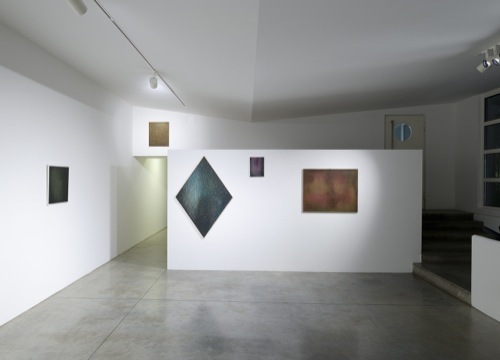 One of the leading figures of the postwar art world in Venice, Deluigi was active in Spatialism, a movement inspired by Lucio Fontana’s concept of the pictorial surface as a space of cosmic events. For Deluigi, “Grattage” shows traces of his invention of a distinctive technique, but also, and above all, the action he performed that allowed his vision of a new space to take material form. With their carved patterns, the intensely luminous paintings almost seem to give off intermittent vibrations, while also evincing a pervasive plasticity. The liquid, subtle colors all over these paintings bring to mind the hues and currents of the Venetian lagoon; they dissolve into undertones that merely hint at space. Seen together, they almost seem like swatches of light, perhaps the golden tiles of a mosaic—a medium that Deluigi, not coincidentally, embraced in parallel to painting throughout his career.